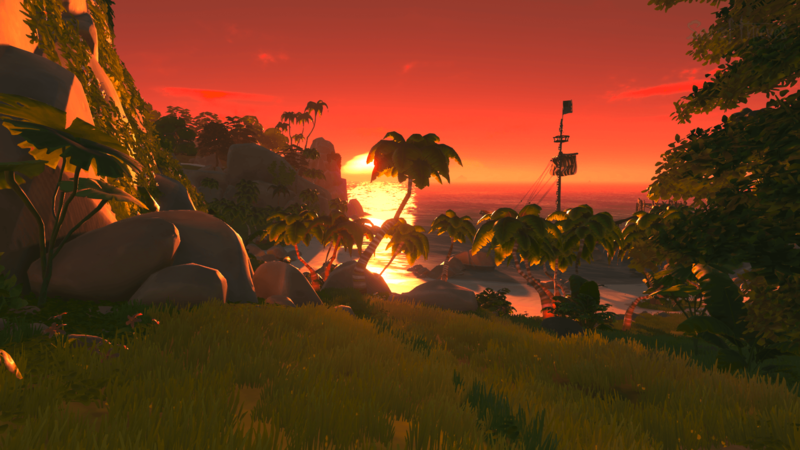 The sun has set on the Sea of Thieves Closed Beta as Rare sails towards its next horizon – launch date. After a week of plummeting the high seas with our crews, digging and stealing treasure, mashing skeletons and sinking our ships – accidently of course, the Sea of Thieves Closed Beta had us all hooked with its brilliant levels of surprise, delight, and humour. It became the most viewed game on Twitch and Mixer throughout the Closed Beta period on multiple occasions, and it even reached maximum server capacity over the weekend as well. So, you may be asking yourself – what’s all the fuss about? Why are people so eager to play Sea of Thieves and watch others play it, finding treasure and firing cannonballs at other ships? Well, that right there is why. The idea of manning a ship with your friends on an epic pirate adventure in search of hidden treasure and mythical beasts is what makes Sea of Thieves so much fun. The sense of discovery and awe as you find something you never expected, or when you see another ship heading towards you on the horizon makes you eager to continue playing. Ahoy there matey, and welcome aboard . You're in for the adventure of a lifetime. The frantic rush of loading and manning the cannons to defend the ship, lifting the sail and dropping the anchorage as you prepare to dock, and repairing the holes and gathering up all the water in buckets and throwing it overboard to prevent your ship from sinking. There’s a real adrenaline rush to it, but in the process, a ton of laughs, and a new tale and story to share. That’s the thing with Sea of Thieves that you don’t see often, but that constant need to talk about what you did with your friends last night, or perhaps with a random group of pirates you found online. When our ship accidently sunk for the first time, I wasn’t mad, or annoyed, or even sad. I was dying with laughter as the sequence of events that led to that were hysterical. The adrenaline rush of seeing the boat fill up with water as we began to lose control of it, capsizing over as it dropped into the ocean and hit the bed of the sea as deadly sharks came and attacked us before we were miraculously saved by a mermaid – who teleported us back to an outpost with a new ship ready and waiting for us to man so we could hit the high seas once again for some more plunder and adventure. It's moments like that with your friends that you treasure in games. A sunken ship may lose you all your treasure, but another will always be waiting. Sea of Thieves highlights what’s most important in games, and that’s to have fun. Part of me feels like we’ve almost lost that over the years, and to see Sea of Thieves put that at the forefront of its core gameplay experience puts a massive smile on my face. It’s not just me, however. Over the last week, I’ve had the pleasure of seeing other folks share their stories and tales from Sea of Thieves, and some of these have been really funny, whilst others are incredibly heart-warming. One of these stories saw a family playing Sea of Thieves together and having fun as a pirate crew in search of hidden treasure, whilst another saw a crew tame a shark and teach it unique tricks. The shark was calm, and part of their crew, and one of the screenshots they shared even showed it with skeletons on top of it, looking as if they were almost dancing. It was brilliant. Speaking of dancing, before one of our long voyages, we met a random stranger at the outpost. They were waving towards us, and instead of the usual griefing you come to expect from online games, we started playing music on our accordions, jumping up and down, and drinking grog. 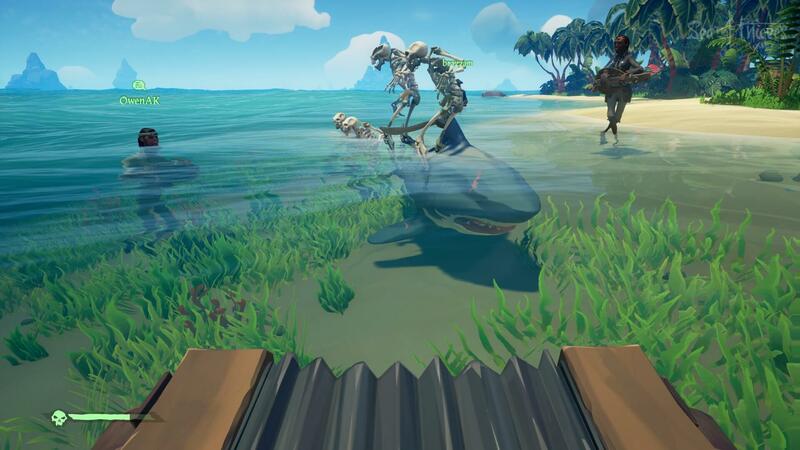 A tamed shark with skeletons above it whilst music is played (via allofthenorth). It brought me back to the early days of Xbox Live, when everyone you met online was friendly and happy to engage with other players, help them out, and learn new things from them in the process. It’s a nice thing to see, it really is. Rare has created something that brings players together and showcases their emotion. Sea of Thieves perfectly captures our emotions, it knows what makes us happy – such as finding hidden treasure, completing a quest, and being duly rewarded. It knows what makes us sad, such as another crew coming to attack us and sinking our ship, leaving us as food for the sharks that roam the seas. In the process of all this, we’re still having fun and enjoying every moment of it. Perhaps we’re sailing into a thunderstorm with lighting and uncalm seas, with darkness capsuling the skies and fear being spread throughout every bone in our pirate bodies, or maybe we’re anxious as we see other ships around us. Sea of Thieves can really depict and bring out those emotions, but it does so in a way that works well and keeps us engaged. It’s a nice change whenever I log into Twitter and see people sharing their stories, videos and images from Sea of Thieves, rather than whatever is going on in the real-world that I’d probably prefer to not know about to be completely honest. Three beautiful and vast ships. I wouldn't like to take those on (via Sandmanistheman). 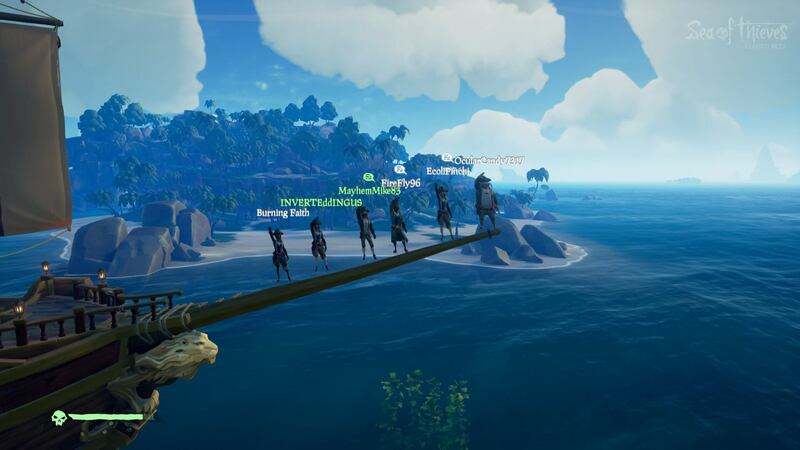 The folks who played Sea of Thieves with their friends and formed a crew are the ones who loved it the most, and I saw that in the screenshots people shared online and many of them had fellow crew members in them. It’s no surprise, but seeing their antics and discoveries felt nice, it was special. 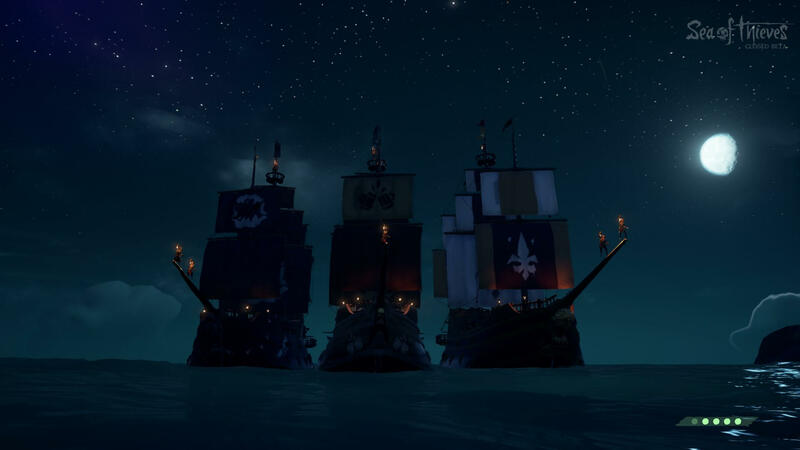 I saw one user who shared a photo of three incredible and vast ships side by side – three different crews proudly posing their ships, and rather than attacking each other, they simply wanted to play together and have fun. Tell their own stories and explore the world of Sea of Thieves in a unique way. Another image from the same scene showed all the pirates lined up on one of the bows on the ship. 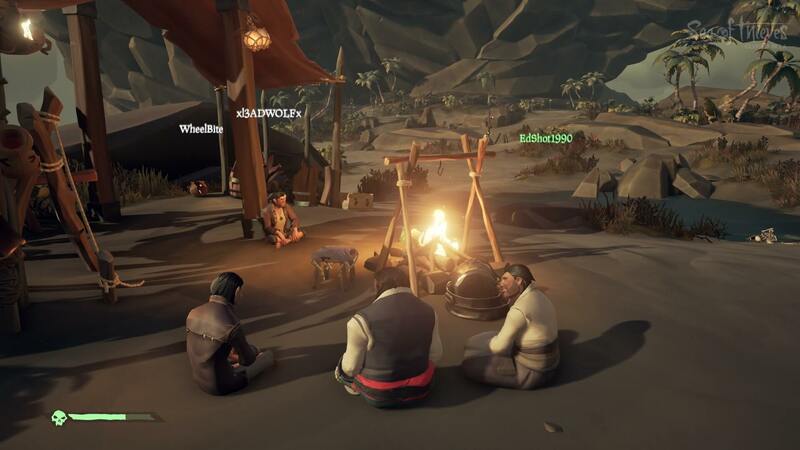 Another one I liked featured a group of pirates sitting by a campfire in the final few hours of the Closed Beta, and before long, they were joined by another pirate crew there as well – after an epic two-hour fight of course! 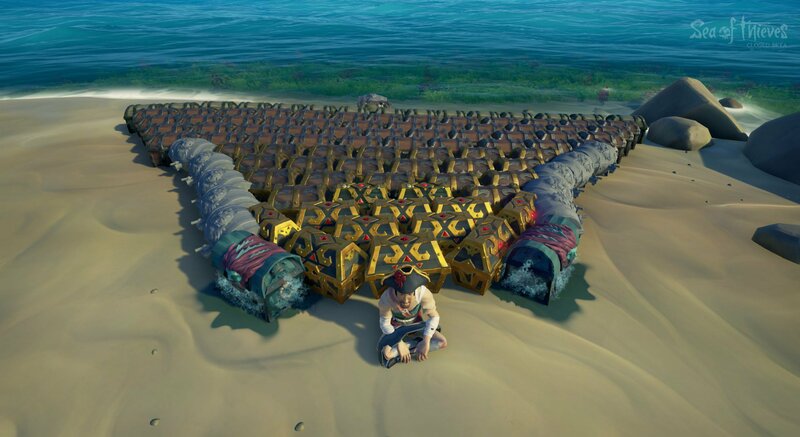 I also saw lots of pirates posing with their treasure throughout the Closed Beta, with someone having more than 100 chests at once! Blimey heck, even I didn’t get close to that, but to have that many chests in one haulage shows real pirate skill and courage. Emotes, such as waving farewell to the Closed Beta in its final hours was also something I saw a lot of in my feed as the technical test concluded. Those final Closed Beta moments shall never be forgotten (via Tried0Failed). There were also plenty of videos shared, including some that saw pirates being shot from cannons, and even ships being sunk and destroyed. There’s this real sense of happiness and joy when you browse these screenshots and videos posted from Sea of Thieves, but it also makes you wonder, what exactly happened and what inspired these scenarios? It goes back to how Sea of Thieves emphasizes fun and the idea of crafting your own adventure to be a pirate legend. Sea of Thieves offers you unlimited freedom, to explore and conquer as you please, and with no set objective until you start indulging yourself in the brilliant questlines, there really isn’t a greater expression of freedom out there. Sailing the high seas with your friends in search of pirate treasure and mythical legends. It’s what Sea of Thieves is in a nut-shell, but regardless of what you’re doing, the key element of having fun is always at the forefront of the overall experience. Gorgeous, vast, and epic. Sea of Thieves offers all the freedom you need (via ukimagic309). I will say, I do hope the full game offers some simple objectives for newcomers initially, giving them a helping hand with the core gameplay mechanics and introducing them into the world of Sea of Thieves. It’s important that players are drawn into the experience and become engaged, and don’t feel lost when they first start playing, as that’s how myself and a few others I know felt for the first hour or so of playing it. Once we knew how everything worked in Sea of Thieves, we were hooked and out exploring this vast world on epic voyages. 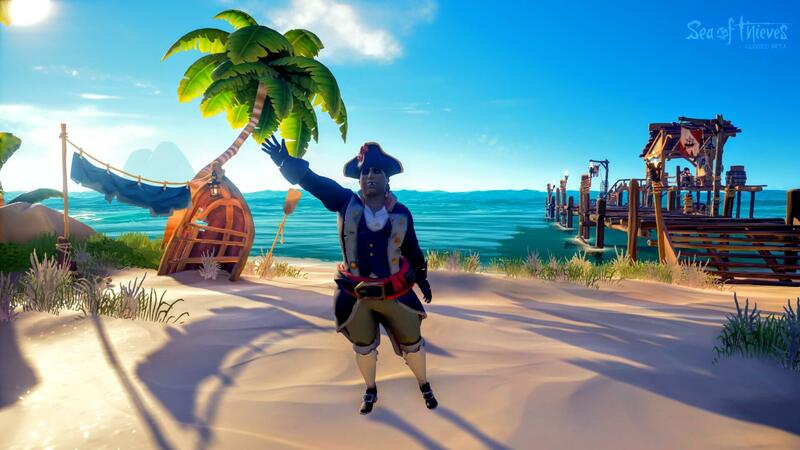 Whilst Sea of Thieves focuses on online and shared open-world experiences, the game can still be enjoyed in solo play in the same shared environment. So, whilst you’ll have a smaller, but faster ship that you’ll have to control yourself, you should be able to outrun any larger crews that may try to hunt you down and feed you to the sharks. Quests can also be completed in solo, and in fact, the entire game can be enjoyed by yourself if you desire. Now obviously, Rare doesn’t recommend playing in solo all of the time, and I’d also advise to avoid it if possible. Co-op is the ultimate way to experience Sea of Thieves, and the Closed Beta proved it. All my biggest laughs and moments of joy in Sea of Thieves so far have come from co-op play. 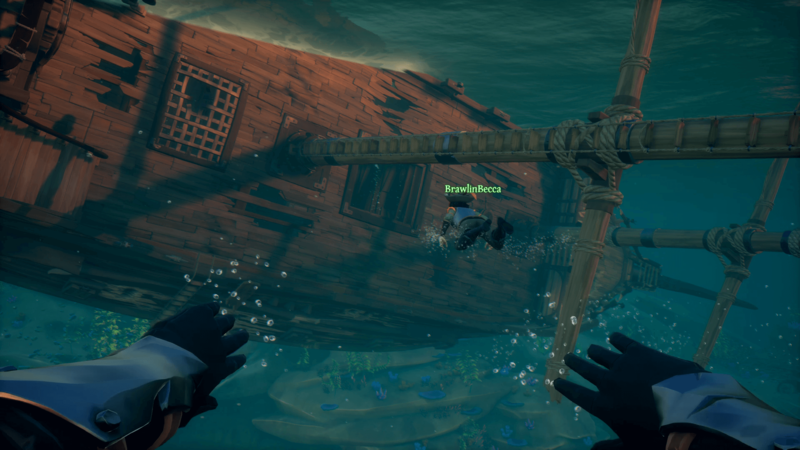 I love the 2-player crew sessions with another friend as it feels like a proper co-op game, where it’s you and your mate having to find treasure whilst fending off other ships and skeleton enemies. I like that idea a lot, but it also meant we could both figure out the controls in the game easily and enjoy quests whenever we desired. It took us about an hour or so to figure out the ins and outs of Sea of Thieves, from the controls and overall mechanics to the idea of finding quests, enabling them, and then finding their relevant locations on the map to sail towards. Solo play allows you to do all this as well, and if you’re focused on the types of quests and objectives you want to complete, it’s still an enjoyable experience and retains the charm that makes Sea of Thieves so special. I loved being in control of my own ship, fixing any holes that might come through, and just sailing into the sunset or navigating through a massive storm, and watching the transition from night time to a beautiful sunrise. Like online, it's still a lot of fun, but it's also very relaxing, and allows you to soak in the athmosphere and really enjoy its georgous world. It's almost a form of meditation, and I appreciate that a lot. Just sailing through the waters with your mind relaxing and enjoying the beautiful vistas and scenes on offer in Sea of Thieves. The artwork and colours found in Sea of Thieves shine when experienced in HDR. Because Sea of Thieves supports HDR, the lighting and contrast looks incredible on a 4K HDR display, and I love how it all blends so well with the unique Rare art-style found in the game. Playing in solo allows you to soak in the enviornments and graphical features of Sea of Thieves, and really appreciate what Rare has done here with the game. Sailing is so much fun, and it's so relaxing. 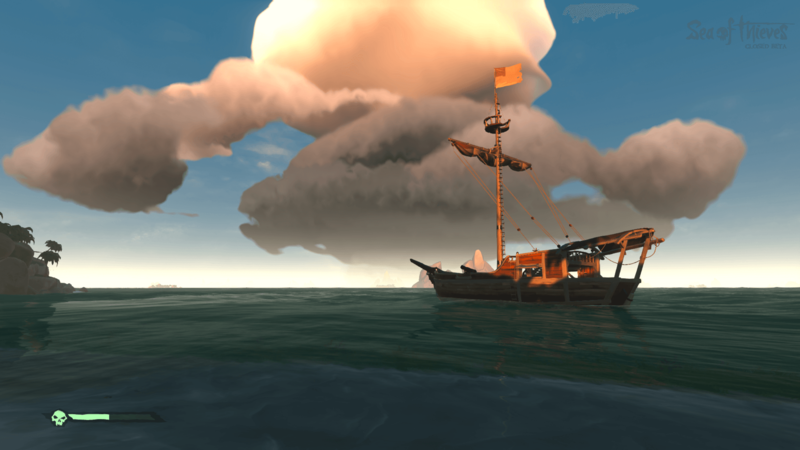 If you want some time alone, perhaps just you and your thoughts, or even if you just want to escape the real-world and any responsibilities that you have for a bit, taking command of a solo ship is something to appreciate, and I can even imagine this being the definitive way of a parent and child enjoying Sea of Thieves together. It's something that's really special. Sea of Thieves looks great on Xbox One, but it’s sure to look even better in March when the game will be playable in native 4K with improved visuals across the board with the Xbox One X Enhanced release, the features of which weren’t included in the Closed Beta except for HDR, as mentioned earlier. 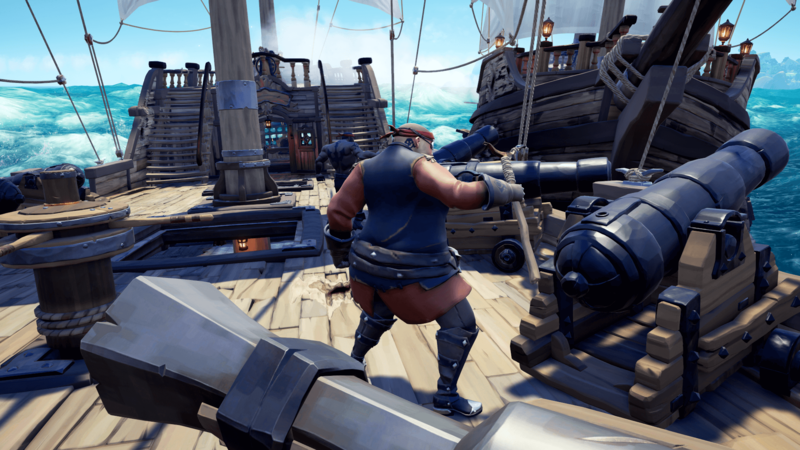 It’s also on PC, where it can be enjoyed at the same level of visual fidelity at 60fps, and because it’s an Xbox Play Anywhere title, fans can play Sea of Thieves on both platforms with the one digital purchase, or even for $10 a month with the Xbox Game Pass subscription service when the game launches on March 20th, 2018. Sea of Thieves looks beautiful, whether you're on Xbox One or PC (via bleednornge72). There’s also seamless cross-play integration between Xbox One and PC, so you can play with those on both platforms in the one crew, which is sure to lead to even more stories. You may be on Xbox One but encounter a ship of either friendly of thieving pirates who are all playing on PC. Perhaps your crew has players from both PC and console? 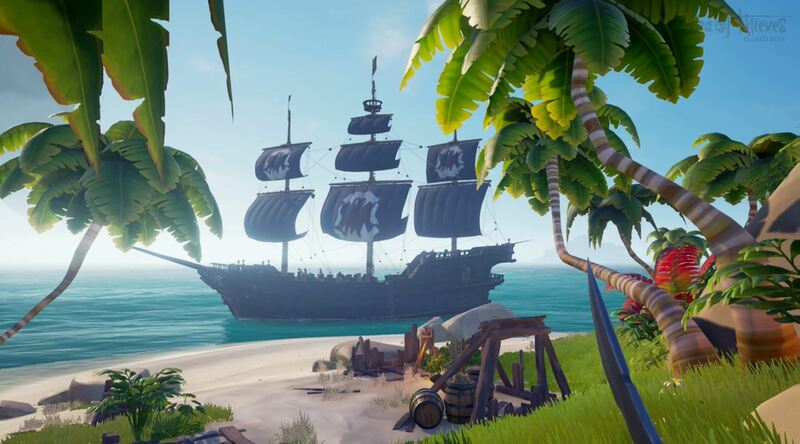 The beauty is how Sea of Thieves and cross-play work together in harmony between Xbox One and Windows 10, so you can play with your friends regardless of their platform choice. Rare has also excellently optimized the Windows 10 version so it’s even playable on low-end hardware. Regardless of how you play or the platform your friends are on, you can all enjoy Sea of Thieves together without worry, and you can even switch between Xbox One and PC with all your collectable loot and progression saved thanks to profile synchronization. The above video from Greenskull showcases some cinematic shots of the relaxing views at sea in Sea of Thieves, and these have been captured on both Xbox One X and PC. When you add it all together, you have the ultimate Rare experience in Sea of Thieves. Something which defines fun, happiness, and expresses feeling and emotion. It’s a game that’s well-built and optimized – created with the community in mind. 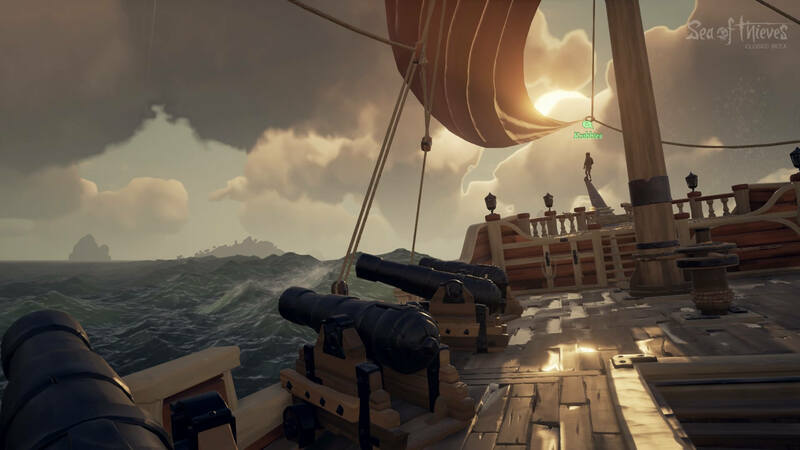 We saw how the Technical Alpha had players in the community testing out Sea of Thieves over the last 12 months, finding issues to report and providing feedback on their experience directly to the development team so they could deliver a game built with the community and fans in mind. Sea of Thieves is a Rare game built for Rare fans. Here's 100 or so chests to show it (via Maverin). Heck, there’s even tons of community Easter eggs in Sea of Thieves, including immortalising players into the game itself that will be there forever. For example, there’s one cliff with a few skeletal feet sticking out of the ground with a rock above them, and the Xbox Live Gamertag inscribed here was the first person to die of fall damage in the game. Meanwhile, the first person who died in the Technical Alpha had their Gamertag inscribed on the Ghost Ship. There's even a book beside some skeletal remains in a cave that features popular community members 'Xbox Pope,' often know as 'Gerodie Tommy,' and 'Xbox Addict' inscribed onto it. Now that's what you call true fan-service, and it's something that will be featured in the game forever. Sea of Thieves doesn’t have its own Blackbeard yet, but the idea of having a player who becomes that person, that legendary pirate, is something Rare and the community itself would love to see happen – the most feared, notorious and villainous pirate to roam the high seas. But of course, they'll need to venture out in search of buried treasure and take down other pirates in order to attain that title and rule the high waters. The typical adventure in Sea of Thieves will see four players go out on a voyage, and perhaps they’ll come across a shipwreck, find a riddle map and solve whatever is inscribed onto it – firing themselves out of cannons to board another ship and go through a storm, before eventually falling into the ocean and being eaten alive by sharks. If it sounds familiar to you, that’s because it’s what was shown during Microsoft’s E3 2017 briefing last year – it’s your typical Sea of Thieves adventure, where it’s all fun and laughs. A sunken ship left abandoned. Who knows what kind of treasure or Easter eggs await. What you don’t know is how your crew will react to situations, and this is where every story starts to be different, and what makes videos and livestreams on Sea of Thieves so intriguing to watch. You might be helping a streamer solve a riddle, or watching a player shoot themselves out of a cannon into a cliff-face, before falling onto the ground and being attacked by skeletons. These are the types of stories we’ll see people continue to share from Sea of Thieves, and once the full game releases – which features far more content, quests, pirate customization, and locations, then there’s going to be even more unique stories to tell. With the emergent gameplay of Sea of Thieves, you might also experience different variations of quests where your crew gets distracted as you see another ship on the horizon, or perhaps a shipwreck or an odd-looking island. Overall, Sea of Thieves see you on a quest to become a pirate legend. There’s no objective set in stone because how you get there is up to you. Whether you want to be the most feared and notorious pirate out there, or someone who knows how to explore the high seas and solve riddles, there’s multiple ways to get there. It's all about the journey and the story behind it. A legendary moment from Sea of Thieves. I'd love to know the full story (via Sandmanistheman). A crew who cooperates will always be far more successful than one who doesn’t, and that can be especially seen in the basic gameplay mechanics, such as how multiple players are required to lift the anchor and sails, or how chests are held with two hands, so you need one player to watch your back, and another to hold a lantern to offer visibility. It’s why solo play will come at a disadvantage to you, but if you’re a skilled enough pirate, that may not be an issue. Whether you’re playing every night with your best mates, or you discover a crew of new friends, Sea of Thieves is about bringing people together, sharing stories, and having fun. 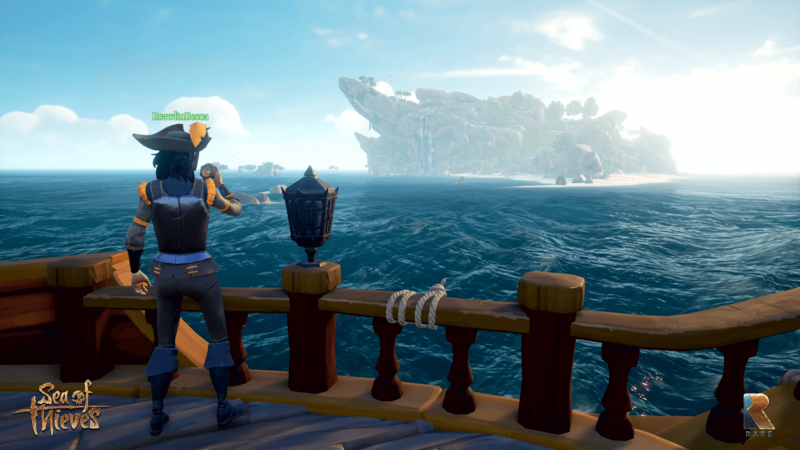 The Closed Beta over the last week proved that, and it showed how eager players are to dive into the experience of becoming a pirate legend. With Sea of Thieves launching on March 20th, 2018 on Xbox One and Windows 10 PC, we have about seven weeks to wait before we can hit the high seas with our friends again. Just remember, the full game will have a lot more content included, with more quests to tackle, new customization options to personalize your pirate and ship, and new locations to discover with mythical creatures to take down. I simply cannot wait. A fond farewell to the Sea of Thieves Closed Beta. You'll be missed (via krdgames). Sea of Thieves has shown what’s most important in games, and it has done it in a way that’s authentic and heart-warming. 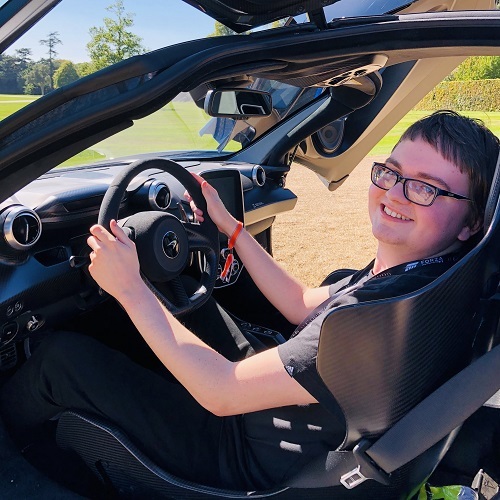 It really does put a smile on my face seeing the stories, videos, and photos shared onto Twitter, and then watching the livestreams and YouTube videos as players discover new and exciting features they didn’t know about before whilst the chat helps them solve clues and riddles. It's so remarkably brilliant, and from what we've played so far, Sea of Thieves is shaping up to be the must have Xbox One exclusive this year. 2018’s Game of the Year might just be around the corner, and it’s fair to say that Rare are back, doing what they love most, and doing what they’re best at. Making incredible games, crafting vast worlds with their unique art-style, and of course, bringing people together to have fun.